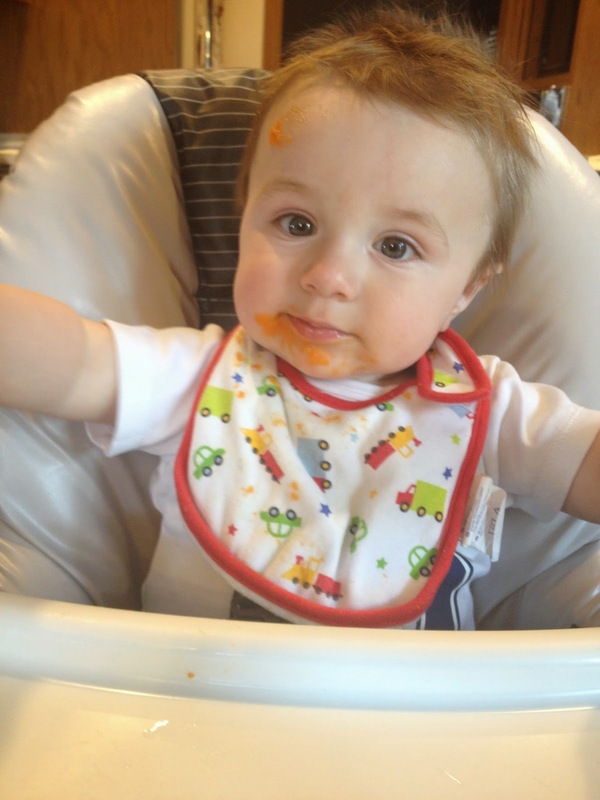 At long last I thought I'd finally share an overdue post I've been promising about how we do baby food for Oliver. I've had some questions off and on and I've been meaning to do this, just hadn't had the chance yet! So, today is the day! 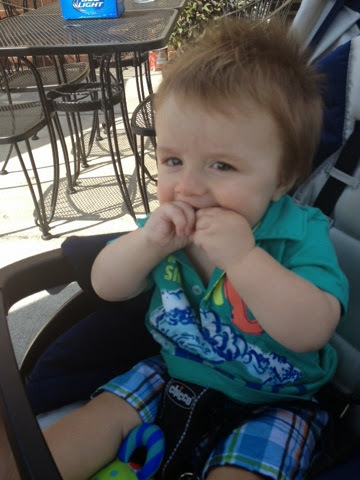 First off, Oliver is still a breastfed baby and will be a breastfed baby until at least age 1. All babies need breastmilk or formula until at least 12 months and receive the majority of their nutrients from either resource. There's a phrase that says "food before one is just for fun" and we do fall into that camp a little bit, but we're still working on teaching him to eat all sorts of things. There are lots of approaches to feeding your baby - and I'm definitely in the "whatever works to feed your baby is what works" wagon. I'm merely sharing what worked for us - it won't work for everyone and again, whatever you choose to do is best - as long as your baby is happy and fed, then that's all that matters. Anyway, early on we talked about a couple of different methods to solid food. We considered doing baby led weaning - letting the baby try small bits of food that you're eating whenever they start showing interest. We also talked about making our own baby food purees. We were all game to try the baby led weaning approach - but then we realized that due to Ollie's schedule, many times we were eating after he went to bed or while he was napping - so he was never around us when we were eating to even show much interest in what we were having. We decided to go back to idea of making our own purees. At our six month pediatrician appointment, Dr. Uncle mentioned that there are a couple of ways to approach introducing food - here in the US the popular thing to do is start with cereals and then move into fruits and then veggies. The European approach is to go more for veggies with very little grains or fruit at all. Specifically this is practiced in France. We talked about it and did some research and decided we wanted to try the French method. 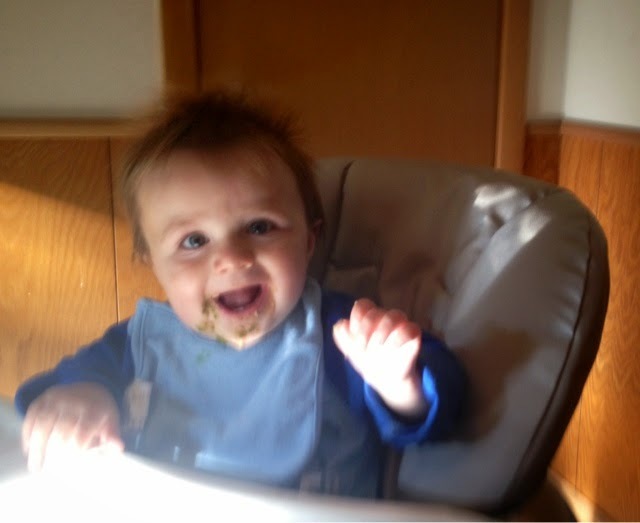 We found a fantastic blog written by a French transplant to the United States about how she fed her baby, complete with recipes and a schedule of what to introduce and when. It's called French Foodie Baby and it's just great. We ended up starting a little behind the schedule recommended by the blog, only because we didn't really look into it until after Ollie's six month doctor visit. In fact, it took us until he was almost seven months old to really dive into it, but it still worked out pretty well. We started with some very mild flavored veggies - green beans, potato, carrot, etc. Then we worked into things like broccoli, cauliflower, and even things like endive and leeks. The idea is to introduce as many flavors and textures as possible with the hope that by the time your child is between 1 and 2 years old they will have a pretty wide pallate and be willing to eat just about anything. The process to make the food is pretty simple. Most veggies just require about 20-30 minutes of steaming. Then you let them cool down and then puree them in a food processor - adding the water you used to steam them for some moisture. Then we packed into food storage containers and spooned out what we needed at mealtime. If we had more than one container, we'd freeze one for later. I know some people use ice cube trays to freeze purees and I could see that working well too, but we found that the containers were fine, we were able to easily scoop out what we needed. When you start introducing foods you should go on a schedule of four days to one new food to make sure there are no allergies. We worked our way through the schedule laid out on the blog and it took us about three months or so. After about two months we added breakfast and after about three months we added dinner. For breakfast, we tried doing yogurt, but Ollie was most definitely not a fan, so instead we give him oatmeal - actual regular oatmeal, not the baby stuff - with a little fruit mixed in. For dinners we started making meat purees that were recommended by the blog. The meat purees are not unlike the veggie purees, we steam a veggie and cook some meat and then blend them both together in the food processor. It might sound like it's really labor intensive to make our food, but it really isn't that bad. We usually take one evening and make up our meats and veggies for the week and that's it. You don't need much special equipment other than a food processor and a steamer basket. We've been super lucky that a majority of the veggies we wanted to introduce were veggies we were receiving in our CSA share this summer. And you're probably wondering - how does Ollie like his food? He loves it. It took a few days in the beginning to get him used to it, but he rarely turns his nose up at anything we offer him. He's not a fan of cucumber or melon types of food, but that's about it. At his nine month doctor appointment we were given the go ahead to start offering him just about anything we wanted save for cow's milk, nuts, honey or anything that poses a high allergy risk like shellfish. So, we've slowly started kind of doing the baby led weaning approach in addition to his purees, we offer him little bits of what we're having when he eats with us, which is happening more now that he's older. He loves when we offer him things off of our plate if we're at a restaurant. We also give him cut up pieces of tomato, bread and cheese and he loves those. And homeboy is a carnivore - he sure loves his meat!! So there you have it! Kind of a quick summary of how we feed Oliver. If anyone has any questions I'd be happy to answer them! But again, I can't stress enough, you need to feed your baby in the way that works best for you, no judgement on how you choose to do it!